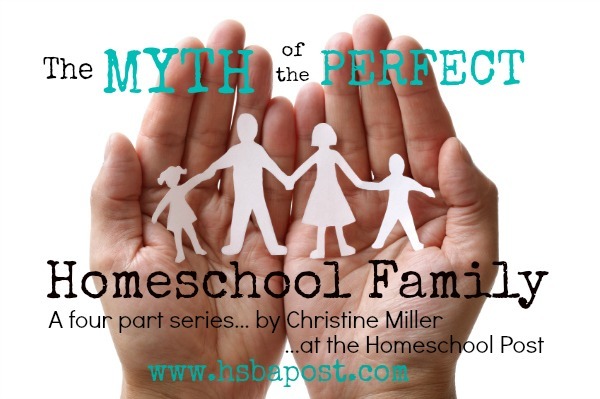 Just in case you missed the first article in Christine Miller’s “The Myth of the Perfect Homeschool Family“, you should hurry over to the Homeschool Post and check that out before we post her Part 2 this Sunday or Monday. Part 3 and 4 will come in the next couple of weeks, each a week apart. Christine’s story is one of heartbreak and healing — a very difficult journey and a testimony to the power of God to work miracles on broken hearts and lives. Believing your kids (or you, even) will never fail just because you go to church and homeschool your kids is a common misconception. Anyone can fall. Christine shares the story of how her family splintered in the midst of “Christian homeschooling”, and how God put it together again. I hope that you will take the time to read it – and to comment – because it is surely a blessing to have a homeschooling mother who isn’t afraid to be honest and admit her own mistakes and the difficulties her family struggled through. If you are out there teetering on the brink of throwing your hands up in defeat, STOP! Go read her article series. Take a deep breath. Start a prayer journal. Get a prayer partner. Be real about your needs and pray for God to rescue you. He listens for us to cry out.